Premise- A panel of four celebrities must figure out what the contestant’s secret talent is, word by word, by solving it on The “It” Board. In each round, the panel will have to answer yes-or-no questions to the contestant to help them guess the secret talent. During each round, the panel will be given a clue to help them further by either being shown an object or the “Clue Force 3” acting out or drawing a clue. The first round lasts for 60 seconds and the second and third rounds last for 45 seconds. Every time a panelist guesses a word that is related to the contestant’s secret talent, the word is revealed on The “It” Board. For every round the panel fails to guess the secret talent, the contestant wins a prize. If the panel successfully guesses what the secret talent is within three rounds, the panelist win the game and the contestant will leave with the prizes they have won in the prior rounds. However, if the contestant can stump the panel through all three rounds, the contestant will win all three prizes, including the grand prize trip. At the end of the game, the contestant demonstrates his or her talent. Secret Slime Action: At the beginning of round two of each game, a random member from the studio audience to win a prize if at least one panelist performs the “Secret Slime Action”. The Secret Slime Action is secretly announced at the beginning of the second round to the home viewers. Secret Slime Actions can vary from physical actions, like touching your head, to saying a certain phrase. If a panelist performs the Secret Slime Action, the clock will stop, the panelist will get slimed and the selected audience member will receive a prize (which is usually Figure It Out paraphernalia). Word of Honor: During each game, one word from The “It” Board will be designated as the “Word of Honor”. If a panelist says the Word of Honor at any time during the game, the clock will stop and the contestant will get slimed. Nickelodeon has always done an excellent job when it comes to reviving game shows and this Figure It Out revival is no different. 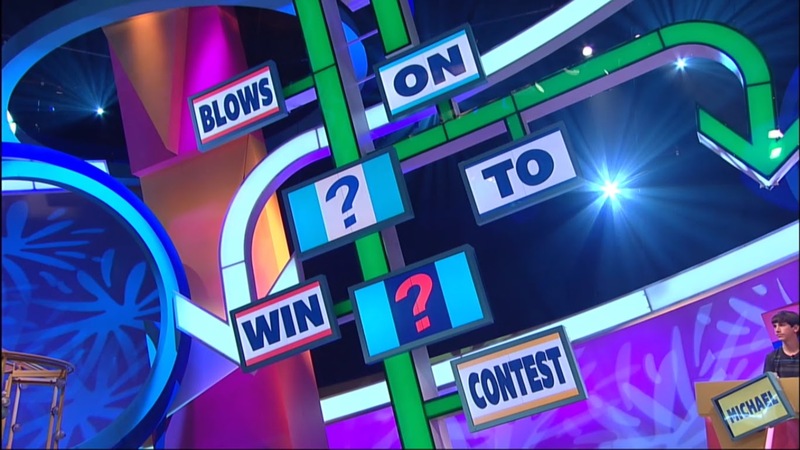 Like with Double Dare, Wild and Crazy Kids, and GUTS, the 2012 Figure It Out revival retained a lot of rules and elements from the original version, such as the Charade Brigade (now called Clue Force 3), the Clue Recap board, and the cool prizes. However, I am disappointed that they replaced one of the main staples of the series, “Billy, the Answer Head”, with the less-appealing “It” Board (even though an outline cutout of Bill, the Answer Head can be seen during the opening sequence). Nevertheless, the show made the proper changes where necessary and even adding new features, such as The Word of Honor, to make each game more interesting to watch. Jeff Stuphen is a good host for this show, although he seems a little subdued compared to his hosting duties on BrainSurge. I also admire his slightly devilish demeanor when he shamelessly tricks the panelists to do the Secret Slime Action. Stuphen’s deviousness reminds me of how he tormented the contestants before he activate the device to removed them from the show when he hosted 101 Ways To Leave A Game Show. The only changes I don’t like in this version are the reduced round times for the second and third rounds and the Secret Slime Action replays. Reduced 45-Second Rounds: While the reduced round times challenge the panelists even more to guess the contestant’s claim-to-fame, the 45-second rounds takes away from the show a little and rushes through each game unnecessarily. It would make more sense to have 60, 45, and 30-second rounds or to just simply make each round 60 seconds in length. Jeff Stuphen is a good host for this show, although he seems a little subdued compared to his hosting duties on BrainSurge. Secret Slime Action Replays: One of the main functions of the Secret Slime Action is to show the panelist(s) performing the action. On the second episode during the first game when the replay showed a panelist getting slimed for “shrugging their shoulders”, you couldn’t tell through the replay whether or not she actually shrugged her shoulders. Overall, the Figure It Out revival is fun and entertaining to watch, especially watching the kids exhibit their special talents and the host and panelists engaging in some of the stunts. The contestants and celebrity panelists look like they are having a lot of fun being on the show and getting slimed as well. It would be interesting to see a few family episodes of Figure It Out in the future, but we’ll see what happens. Watch new episodes of Figure It Out every weeknight at 7:00pm on Nickelodeon!!! How do you become a contestant on it though?? ?